1. 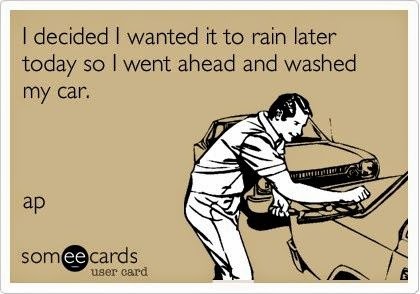 Why it rains after I wash my car. 2. Why are Oreos, Target, and getting my hair done so addicting? 3. Why does ice cream taste so good and the treadmill feels so bad? 4. Why is it that when you really really really need to be somewhere on time, your car doesn't start or your alarm doesn't go off. 5. Why are pimples even a thing? 6. Warm, clean sheets are the best, but why can't beds just make themselves? 7. I would like to know why Tevo fails when I really must watch a show. 8. Why do I get all red lights when I am running late? 9. Stubbing toes, burning your tongue on the first bite of food, and accidently biting your tongue or cheek. All of these are terrible and I stopped trying to figure out why the continually happen. 10. Last but definitely not least, why do clothing stores decide to have "huge, you must go our you will never get these deals again and regret it for the rest of time" sales the moment I decide I need to start saving and stop spending money on unnecessary things. I read somewhere that you know you are in a good place when the things that used to frustrate you can now just make you laugh. I am definitely grateful that this season of my life is full of laughs as I ponder over the ten things I stopped trying to figure out. What is something you haven't figured out and gave up trying? Stop by Emily's blog, Ember Grey, to share what you are grateful for today. This is such a fun idea/post!! So funny. #3 hahaha! I am soo with you on #3 I can always find time for sugar...but running or exercise...gosh, I just seem to busy for that LOL! haha, Shannon!! That is the perfect way to describe it, I am always just too busy to exercise, definitely never too busy for ice cream though! "Why are pimples even a thing?" -- YES! If I could ever figure this out, it'd be great. SO unnecessary! So thankful for Proactiv, lol. I think stores know our thoughts. This happens alllllll the time. Also pimples, yes why?? I had to laugh at this list. It's all so true. Stores must know! And there are so many things we just don't get to understand "why?!" but it is fun to go over them. Thanks for stopping by!! Rebecca, so happy I am not alone on the sheets one! I am so lazy when it comes to making my bed!